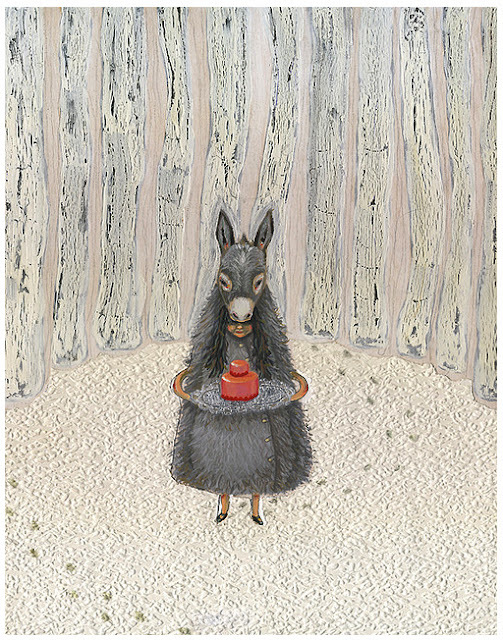 Just discovered this rendering of Donkeyskin on Flickr by artist Jenna Russelle. I highly recommend visiting her Flickr site to see the three variants up close (She-Bear, Gold Teeth and Donkey Skin) and a little fun Gold Teeth experiment/sketch she did with gold leaf too. You can jump to the set HERE and click the arrows at the right to see the others. This is one of the illustrations I put up at the Keep 6 Happily Never After show. Inspired by Charles Perrault's "Donkey Skin." The story varies across cultures but is essentially about a young princess who does not want to marry her father, so she escapes in an animal skin and becomes a scully maid, after which a cinderella type story ensues, involving a tiny ring (not shoe) hidden in food and served to a prince. Always interesting to see new takes on this story! This is one of the stand out stories from my childhood (and I dearly wish I could find the little book I had then). You can see more of Ms. Russelle's lovely work on her Flickr site HERE and at her gallery HERE, which includes some nursery rhyme images.